Joe Parsons‘ first run in the Monster Energy Snowmobile Freestyle at X Games Aspen 2016 was all he needed to secure gold. Earning a score of 90.0, Parsons smoothly transitioned from trick to trick with only a small over rotation on one of his landings taking away significant points. 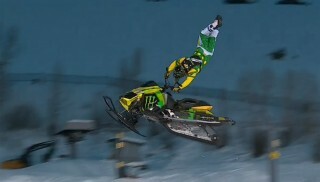 He finished the round with a backflip that saw him turn around and land facing backwards on his sled. Check out the gold medal winning run in the video below. Earning second place was Heath Frisby who scored an 87.66 on his second run to secure a silver medal. You can watch his performance below. Brett Turcotte‘s second run earned him a score of 86.66, just one point back of Frisby. That was good enough for an X Games bronze medal. Watch the medal winning run below.